Thanks for identifying the gulls. I figured you’d probably know. Your statement about salinity puzzles me. How could the Salton Sea have less salinity than the Great Lakes, which are fresh water? I think I’ve got it: I’ll bet you meant the Great Salt Lake in Utah. Oh my bad. Great Salt Lake is what I meant! When I was teaching, I used to call that sort of unintentional substitution a thinko, as opposed to a typo. That can’t be right about the salinity levels. 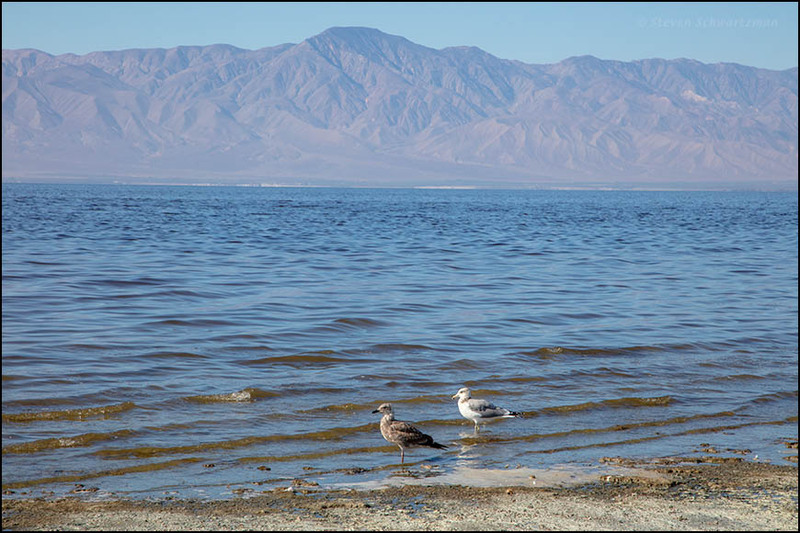 The Salton Sea’s salinity is listed in various places as 44 ppt (parts per thousand), while Lake Michigan varies between .05 and .60 ppt. This map of ocean salinity, while older data, is interesting both for the data and for the way it was gathered. I’m especially fond of the last photo. I’m sure I mentioned in the past the experience of flying along the African coast where the Sahara meets the water. It looked remarkably similar. On the other hand, I’m intrigued by the faint flow of cloud or sand above the dune in that last photo. I think it must be cloud, but it certainly resembles blowing sand. Despite the absence of grasses, the dunes in the second photo remind me of the flow of the Flint Hills prairie. I haven’t heard back from Shannon yet, but it suddenly occurred to me that she probably meant the Great Salt Lake, which is indeed considerably saltier than the Salton Sea. but not in southern California. That must have been a great sight, the Sahara meeting the ocean. Did you manage to get any pictures of it? When I left Africa, I left my camera behind for my students, so no photos for me! Ah, then that means you’ll have to go back someday. ps: I’ll bet that’s exactly what Shannon meant. Between ‘Salt Lake City’ and people in Utah saying things like, “We’re going over to Salt Lake,” I never think of it as the Great Salt Lake. that the Great Salt Lake’s north arm has more than twice the salinity of the south arm. Love your dune abstracts, Steve. Gorgeous! Abstractions are so much fun. In this case my challenge was finding places not messed up by dune buggies. The two places shown here are practically the only unspoiled ones I found. 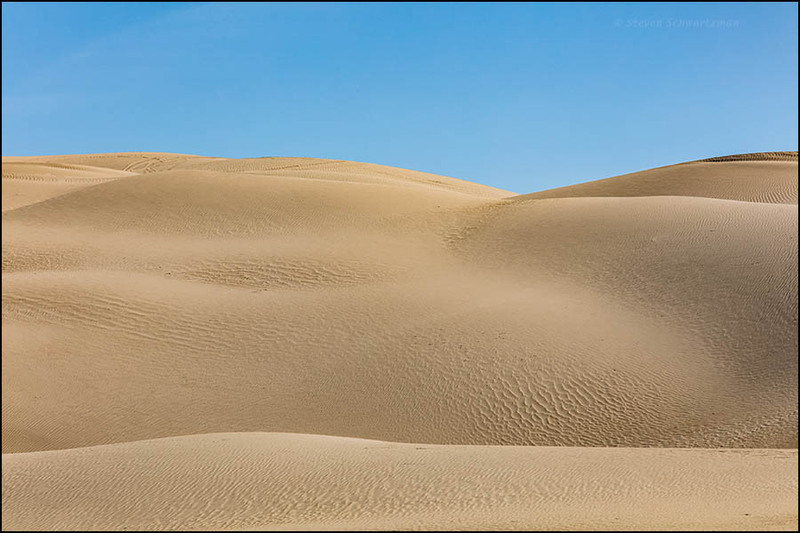 The dunes’ shapes, curves and textures, and nice tawny color are very handsome. I think for many years, you had to use two different salinity levels for the Great Salt Lake, depending on which side of the Southern Pacific RR causeway you were on. I remember my relatives in Utah mentioned a time, when the water level was unusually high, and the lake was actually threatening a busy highway, and they had to punch a hole in the causeway, to drain some of the water from one half to the other. I believe the RR line now installed a bridge in the middle, so the water can pass from one side to the other, and I imagine, the salinity has more-or-less equalized. which gives more details to back up what you said. 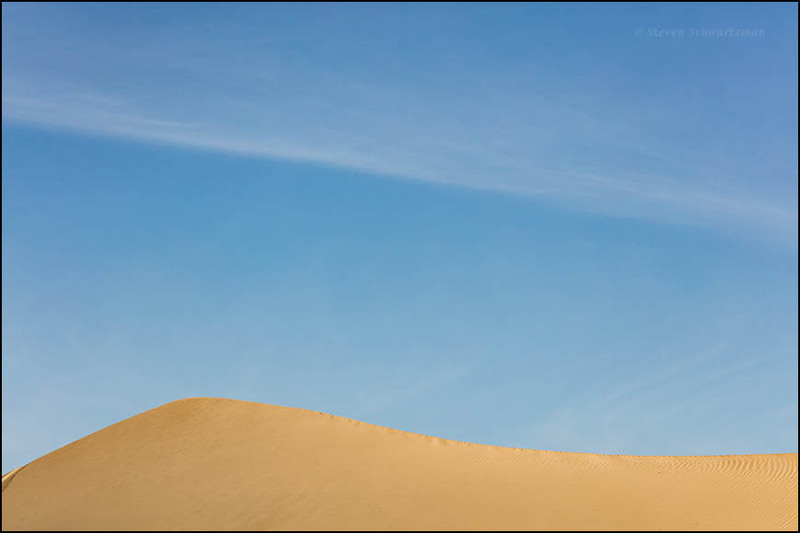 I, too, found the shapes and colors of the dunes handsome. What I didn’t like was that almost all the dunes were marred by the tracks that dune buggies had left. Because of that, hardly anything remained that I could photograph. That happens to be one of the places that I had considered buying a winter home. It is one of the more affordable places in California. However, homes can not be left uninhabited for too long. Where in particular were you considering? Based on what you’d said about not leaving homes inhabited for too long, Bombay Beach came to my mind. I think you did well by not buying a place there. It is not a good place to invest either . . . not that I care about that part. We drove around in Bombay Beach briefly and found it pretty run down. Yes, it is quite abandoned. Although I rather like ghost towns while they are still dying, they are really bad places to invest in real estate, not only because they are so worthless, but because of the unavoidable deterioration (and likely vandalism) that happens when no one is there to prevent it. Trona is even worse. Some of the homes have fireplaces, but there are no trees. When firewood is needed, it is just taken from neighboring homes that are being dismantled for such purposes. We found Bombay Beach pretty creepy and didn’t stay for long. If I’d been after some surrealistic photographs, I could’ve taken plenty. Believe it or not, Trona is worse. I just love it there. As the French say, Chacun à son goût, Each to his own taste. Yes, it is quite . . . ‘scenic’, in a ‘special’ sort of way. I thought you might be interested in this traveling ‘mud puddle’ near the Salton Sea. Thanks for the link. That’s a strange phenomenon, and a reminder of how many things geologists still haven’t figured out.